For when you can't wait! Store DJ has two options for your product delivery. We offer FREE Shipping for orders over $50 (and under 20kgs) to anywhere in Australia, but if you need your gear urgently, then we also offer an Express Delivery service. If you would like to collect this item and save yourself the freight costs please call 1300 858 394. The RODECaster Pro now features multitrack recording alongside a suite of new features in the first major firmware update since release in December 2018. The RØDECaster Pro will now record 14 tracks to your computer’s recording software via the USB output. Make sure you get access to this new feature set by updating to the newest firmware here. The RØDECaster™ Pro is the world’s first fully integrated podcast production studio. Whether you are just starting out, or are a seasoned broadcast professional, the RØDECaster Pro Podcast Production Studio is all you will ever need. The 4 high-quality microphone channels are able to power studio condenser microphones as well as conventional dynamic microphones. You can quickly connect microphones for you and your guests with automatic level setting and one-touch recording to a microSD card. You can literally be recording your first podcast within minutes of taking the RØDECaster Pro out of the box. The RØDECaster Pro comes with eight programmable sound effects pads, for instant triggering of sound effects, music, jingles, applause and ads – perfect for giving your podcast that professional quality. You can record audio direct to the programmable pads from any input, or simply “drag and drop” files from your computer using the supplied software. You can even select your favourite colours for the pad illumination. Have a remote guest you want to interview? Simply connect your phone to the RØDECaster Pro via Bluetooth™ or with a TRRS cable. 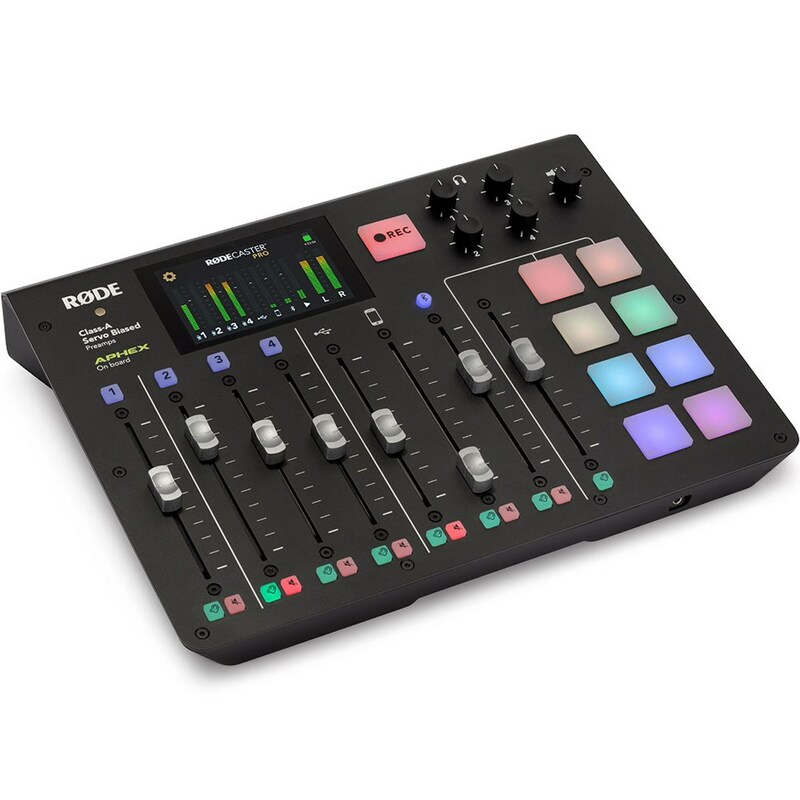 The RØDECaster Pro automatically provides “mix-minus” audio to prevent echo being heard by the caller, without the need to purchase dedicated and costly hardware. Telephone interviews with a remote guest never sounded so good! The RØDECaster Pro’s pristine preamps and outputs feature Class A circuitry, as featured on broadcast consoles that cost hundreds of thousands of dollars. The Class A preamps provide a much cleaner gain structure with lower levels of distortion, providing an incredibly clean, low-noise signal. The Preamps are also servo-biased, keeping distortion levels low. Your signal is broadcast-pure. Your pristine signal can also be enhanced with the legendary patented audio processors, APHEX Aural Exciter™ and APHEX Big Bottom™. These have been incorporated in the audio processing section of the RØDECaster Pro, and your sound will have that rich, warm tone only found in professional studios. The RØDECaster Pro also features multistage dynamics, such as compression, limiting, de-essing and noise-gating. With the lastest firmware update the RODECaster Pro now features multitrack recording. The RØDECaster Pro will now record 14 tracks to your computer’s recording software via the USB output. These tracks are: 2 tracks (stereo left and right) ‘live mix’, as featured on the RØDECaster Pro since its release, a mono track for each of the 4 microphone inputs, 2 tracks (stereo left and right) each for the USB, 3.5mm TRRS, Bluetooth and sound-effects-pad channels. Multichannel outputs can be switched to be pre or post audio processing and the USB main output also has switchable mix-minus for eliminating feedback loops when using computer-based communication apps. 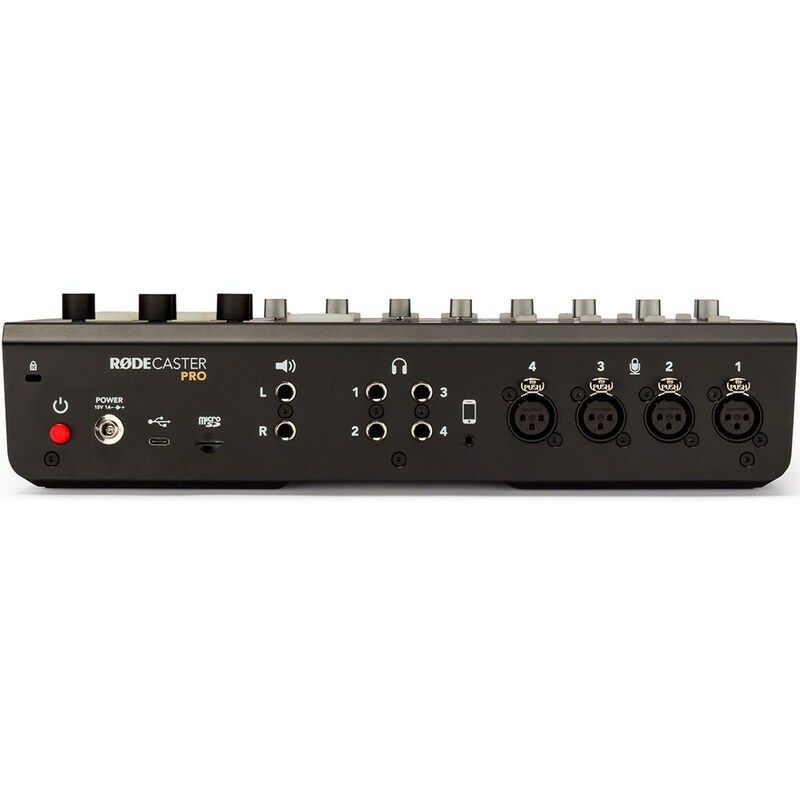 The RØDECaster Pro operates as a standalone unit straight out of the box, recording direct to a microSD™ card. You can be up and running in minutes. The RØDECaster Pro can also connect to your computer via USB, as it is a USB audio interface. This means you can record your podcast to your favourite recording software. The RØDECaster Pro is also able to seamlessly stream a live show – today’s radio! We’re here to help... Our friendly staff are seasoned professionals in the industry, with in depth knowledge on the latest products and technologies. They are available to offer you personalized product advice.